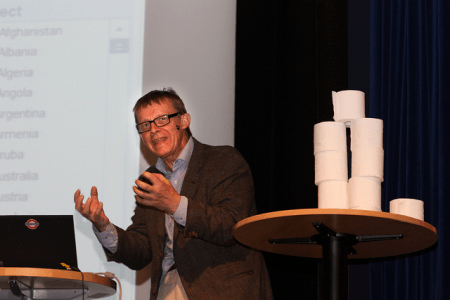 Last week marked the death of Hans Rosling. He was 68 and died a year after having been diagnosed with pancreatic cancer. Rosling was a Swedish statistician who achieved rockstar status for his ability to deliver fascinating presentations of what could otherwise have been dry data. Take a look at his TED talk “Debunking third-world myths with the best stats you’ve ever seen” https://www.youtube.com/watch?v=RUwS1uAdUcI. There is good reason why it has been watched a million times. In his early life, Rosling trained as a physician and during a spell of teaching in Africa, he became interested in using data to tell stories. Together with his son and daughter-in-law, he developed data animation software which helped in the presentation of complex data. However, it was Rosling’s passion for the subject and his self-deprecating humour that caught the attention of the world. He described himself as an “edutainer”. He didn’t just use fancy software in his presentations, he was just as likely to use props such as a stack of toilet rolls to explain projections of population growth. Rosling once remarked, “I told my kids, as long as I can read world health statistics, don’t turn off the respirator!”. His life’s respirator is now sadly turned off, though, true to form, he was reading statistics until the end. We have much to remember him by.